A CSA (community-supported agriculture) is a subscription to a season’s worth of locally grown produce. Fresh, nutritious produce is delivered directly to CSA members by a local farmer throughout the growing season. 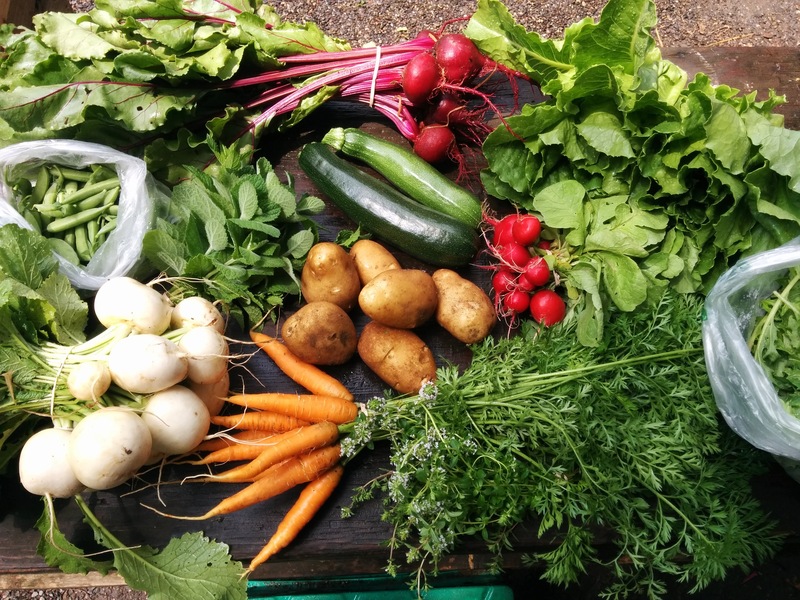 With Community Supported Agriculture (CSA), a consumer purchases a share (also known as a membership or a subscription) in the farm’s harvest before the season begins and, in return, receives a box of seasonal produce each week throughout the growing season. Shares are usually picked up at the farm, although many farmers also have additional pick-up locations. This arrangement helps farmers by increasing cash flow early in the season when seeds and equipment need to be purchased and farm labor needs to be paid. Farm Shares and ASCs (Agriculture Supporting Community) are similar to CSAs in that members receive a weekly box of produce. Farms Shares, however, are typically delivered to low-income neighborhoods, and members are allowed to pay for their shares weekly at pick-up. This makes fresh, local produce more accessible to people who may not be able to pay for the shares up front. SNAP benefits may also be used to pay for the weekly shares. Buying Clubs are a market-style CSA. Rather than receiving a standard box of vegetables each week, members visit the farm and choose the produce of their choice. CSA shares usually contain vegetables, but some farmers also offer the following, either as part of the CSA or as an add-on: fruit, eggs, homemade bread, meat, cheese, flowers or other farm products. There are many CSA offerings in the Greater Lehigh Valley; find one that has a pick-up near you, then click on the farm button below for more details.